Large fields make it hard to see them all and William Thomas was probably the best horse I saw all day although too short at $1.40. It won like a good thing. In the two-year-old I liked Fighting Harada, who looked keen and ready to go, salivating and chewing on the bit, head in to the strapper. The horse had the gun barrier, the number one slot, and just had to jump and run and win. Fighting Harada was slow to begin. The boxer I remember wasn’t a slow beginner, he came out punching! What’s wrong with that jockey? Didn’t he know that he had to boot it up out of the gate? And then the horse was booted up at the 800, when it was all too late, and had to be checked off heels! Fighting Harada made a last gasp surge at the post and I was convinced it had grabbed third but in fact had missed by a head. Very disappointing! I was spitting chips. That horse was ready to win! I should have ridden it myself! In the eighth race I fined it down to two horses, Notio and Eclair Calling. Notio was the classic horsewatcher’s horse, totally relaxed, fit, lobbing around the yard with its head down. Eclair Calling by contrast was a horse that held its head high but in towards the strapper. The horse wasn’t changing gait and wasn’t unsettled. Imperious, dominant, I thought. As a bonus it was trained by Phillip Stokes who doesn’t bring his horses over from Adelaide for fun. And what’s more I noted in my race book that it was a dual acceptor but scratched in Adelaide. Eclair Calling was $2.60 and Notio $1.80. An easy decision in the end. Go for the odds. They finished second and third so that helped to ease my earlier disappointment! One out of two. A good day. Getting cold though. Frustration! I fired up Betfair to lay Widgee Turf in the second and I think I must have accidentally pressed the back arrow, which is a definite no-no on Betfair, and the screen froze. Well, I’ve been in this situation before and the key is simply not to panic. So calmly and methodically I powered the phone off and then displaying a remarkable cool resolve I managed to remember my pin and after a long period of looking at a black screen with a white Apple the phone jumped into life again. But of course by then it was too late! A race or two later I was all set to have a back bet and I fired up the TAB app. But I didn’t login. I was all set to submit the bet when it refused my fingerprint and said my account was locked. Maybe it was something to do with previously powering the phone off? Anyway, you can simply unlock your account by entering your date of birth and mother’s maiden name. Well, how easy is that? Impossible, for me, it seems. After two attempts I gave up. I have to ring Customer Service for more information. So I didn’t have a bet all day. Keen Array, relaxed and head down, looked pretty good powering home for a place at $2.30, but I watched it go around. I rang Rita at Customer Service when I got home and she fixed me up. It seems that all my pins and passwords were out of date since moving house some four years ago. I’ve double-checked my mother’s maiden name and my fingerprint and neither seems to have changed. But I think I need one of those new iPhones that you unlock just by looking at it! Facial recognition, that’ll be the go! My betting opportunities seem to have been limited lately. I suppose it is a self-imposed exile. After all, I don’t do nights at Money Valley, and Flemington is a nightmare with the building site for the new members stand. And I refuse to do midweeks at Sandown until the level crossings are fixed up and the replacement buses are replaced with trains. That just leaves Caulfield. So I was quite keen to get there early in time for the two-year-olds, but the weather forecast was for Armageddon. The front was not expected to pass through until early afternoon so I was hopeful the babies could get a dry run. A pleasant surprise awaited me on arrival. 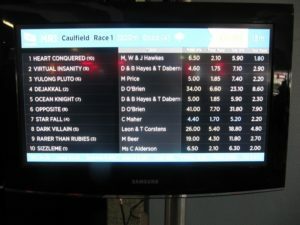 The tote screens have been updated and now display both fixed and tote odds for the win and place. That’s a huge plus for me as I can now compare them easily without constantly refreshing my iPhone and then decide if I’ll do a cash bet on the tote or a fixed on my phone. There is still something about collecting cash that stirs the heart much more than a change in your account balance! It was still cold and dry when the babies appeared in the yard but the wind was gale force and threatened to blow them off the track. A quick scan of the field revealed a lot of horses resisting the jockey and only one horse that seemed impervious to the weather, Ocean Knight. Alert, interested and calm. I positioned myself next to a new screen and watched the fixed place odds blow from $1.85 to $2.55. Hasn’t anyone seen this horse? Ocean Knight jumped away slowly near the rear but blitzed them in the straight to win going away. Could be a good horse. The change of season was sudden and dramatic when it finally arrived. The horses were in the yard for the second but were suddenly obliterated by wind, horizontal rain and hail. 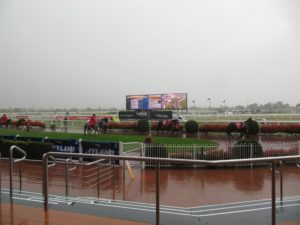 The race was delayed as they were sent back to the stalls and the track downgraded to Soft 5. It was still too wet to venture out for the third, but from a distance Savacool looked the goods. But no bet. The track was downgraded further to a Soft 6. That was my cue and I gave up the battle with the weather. Happy with one out of one. Home in time to see that good horse win in Sydney. Hard to believe it was a balmy 26 degrees on Friday. The best comment I heard all week was that it won’t be 26 again until September! Bendigo? A bridge too far! And now up to day 38 since the cantaloupe scare and no signs of listeria or mental feebleness!